5 Steps to Happier, Less-Stressed Clients: Part 2 | Vickery and Co.
Professional experts are in the unique position to ease stress and tension for clients, making their lives easier, happier and a lot more enjoyable. 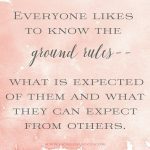 Revisit part one of this post to learn about the first two steps for happier, less-stressed clients: knowing what you are talking about and setting and maintaining clear boundaries. Now, on to the next three tips. Communication: Ok, so we have talked about the importance of setting boundaries — but they mean nothing if you do not clearly communicate them with your clients! People cannot give you want you want if they don’t know what it is. Nor can you give clients what they want and need if you don’t know what it is. Communication is the problem solver here. Have solid office hours and list them in a welcome email that clearly states them. Have a proprietary process when onboarding new clients and communicate that to them in the beginning stages of your planning. Manage expectations: This goes a step beyond communication. 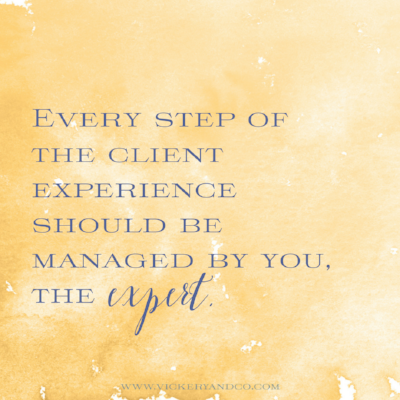 Let clients know when they can expect something from you. Vagueness is your enemy. Owe them a deliverable? Tell them “I will have this to you within a week” or whatever your timing dictates. Do not leave things to the imagination. If you do, their imagination will tell them to expect something from you instantly. We live in a world where instant gratification is expected and this is not a healthy way to operate your business or your life. If you will be out of pocket for a day or are heading on vacation, send a personal email letting clients know and remind them with your out of office responder. But don’t just stop there! Be sure to communicate when they can expect a response from you. Are you checking email once a day, once a week or not at all until you return? What should they do in case of an emergency (which, let’s face it, shouldn’t happen unless your job is literally saving lives)? Every step of the client experience should be managed by you, the expert. Your clients will look to you for action plans, advice and follow through. Arming them with knowledge and managing their expectations keeps everyone calm, cool and collected. Always follow through: This one is simple and it applies to everything mentioned above. Do what you say you are going to do. Always. No matter what. If for any reason, you are unable to follow through, then quickly and articulately let the clients know that you need to shift your commitment. Do not make excuses and do not cast blame. State the facts as they are and re-commit with a new plan. It is not the thinking of things that matter, it is in the doing of things. Do what you say you are going to do.